Happy Active Aging Week! Each year, the International Council on Active Aging celebrates Active Aging Week to engage participants in wellness activities in a safe, friendly and fun atmosphere. Recently, Dr. Paul Hetrick, D.C., R.C.R.D., C.C.E.P., President of The Hetrick Center and Inventor of the HydroWorx 2000 Series pool, presented the webcast, “Aquatic Therapy Anywhere: A Live Clinical Demonstration of the HydroWorx 300 Series“. In this webcast, he focused on how aquatics can be extremely beneficial for the aging population. Two barriers to staying active as we age, are decreased flexibility and strength. That doesn’t just mean we can’t touch our toes like we used to, it can have far-reaching effects on even seemingly minor daily activities. Loss of flexibility. This can present a major fall risk which can result in small sprains, fractured hips and, for those on blood thinners, a brain bleed. Flexibility affects stride length, which decreases as flexibility is lost. When stride length is shortened, individuals can easily be knocked off balance and fall and can have difficulty navigating stairs. Loss of muscle strength. Motion is initiated by the muscles in quads and stabilizing muscles in the glutes. Muscle strength affects ability to maneuver stairs properly and simple purposeful movements such as sitting and standing from a chair. When sitting becomes a free fall into a chair, compression fractures, shoulder, neck, back and elbow pain can arise. Muscle tone is needed to maintain proper form for many activities of daily living to maintain independence. Flexibility and muscle strength can be increased, even as individuals age. Water is one of the ideal mediums to make that happen. When trying to do these things on land or on a treadmill, compression on joints creates pain from lost cartilage. However, in the water, buoyancy removes 80% of body weight, which gives the opportunity to increase stride length and exercise longer without pain or fear of falling. Using resistance jets and treadmill speed, individuals can progress to work harder and longer. For many aging adults whose posture tends to be bent, walking backwards on the underwater treadmill against the jet forces them into extension to work lumbar extensors as a part of the core to increase stability. 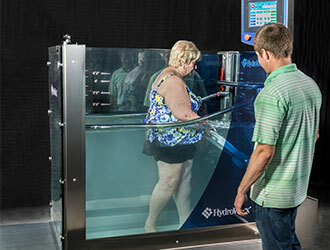 Physical therapists can monitor gait and posture from outside of the unit or via an underwater camera. Harness rigging doesn’t have to be adjusted and moved in order to change planes of motion for backwards walking, side-stepping or carioca. The natural hydrostatic pressure of water creates the same effect as 17 compression bandages wrapped from the feet to the chest. This makes the heart become more efficient and allows blood to flow to the heart and lungs better than on land. Although it is hard to work aging adults hard enough to get into an anaerobic phase on land, this effect means that an individual can turn over blood flow through their whole body without getting to anaerobic phase in the water. Compliance is easily attained when working in the water. Most individuals enjoy the warmth and relaxation of the water. They tend to have greater abilities in the water and thus realize their potential sooner. And compared to land therapy or exercise, they don’t feel the pain and soreness often felt on land. Practicing purposeful movements in the water gives individuals the freedom to attempt things they would otherwise be afraid to on land. They can try standing from sitting in the water, using the buoyancy to help push them up. As they practice, they can be taught how to not use handrails without the fear of falling.